Bandit 650 k8 starter motor. Bandit 1200S (2005) one way clutch noise?? 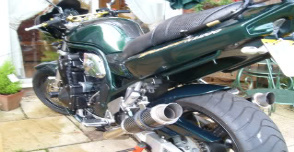 2002 Bandit 1200s turns over but won't fire, something simple? How far should I break down my carb rack? Cold start problem with my 600 Bandit. 2000 bandit 600 electrics stopped working..
are the lambda sensors a common problem on the 1250?